The folks at Ford offered me the chance to test drive for a weekend the Ford Escape 2013 Titanium trim package — the top-of-line version of this newly redesigned crossover vehicle. It was one impressive ride. I regularly drive a six-year-old minivan with lots of bells and whistles, but Ford’s technology and modern features in the new Ford Escape made me feel like I was going back to another era when I had to hand the keys back! I loved how the car drove: a powerful engine and a smooth ride, and I was fascinated to learn the engine is one of the most eco-savvy gasoline-powered ones on the market. The 2.0L EcoBoost I-4 engine generates more power per drop of fuel, utilizing two different technologies to deliver the performance of a much larger engine with the efficiency of a smaller one. On open roads I really enjoyed using the 6-speed automatic transmission’s Select Shift capability, which gives you the “sport mode” performance control of a stick shift without that pesky clutch. Not only the engine is green: the interior of the 2013 Escape uses a majority of green materials, from seat foam made from plant materials, insulation derived from old clothing, and carpets made from recycled plastic bottles. Torque vectoring control is what the engineers apparently call that agile, sports car handling when taking curves. 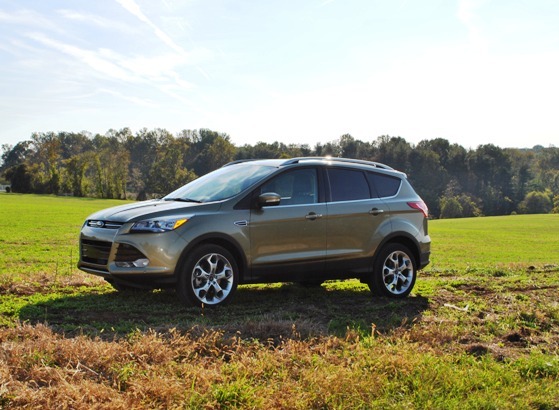 I loved how this SUV/wagon steered when I took it out on the country roads throughout northern Montgomery and Howard Counties, and it was due to the Escape’s transferring of torque to the wheels that have the most grip. 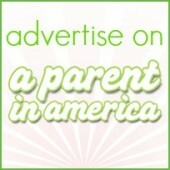 As a mother, I loved learning that the new Escape utilizes the very latest airbag technologies. In the backseat to protect children in a collision is the Safety Canopy System with two-row side-curtain airbags. Up front are dual-stage driver and front-passenger airbags, a driver’s knee airbag and front seat-mounted side airbags. 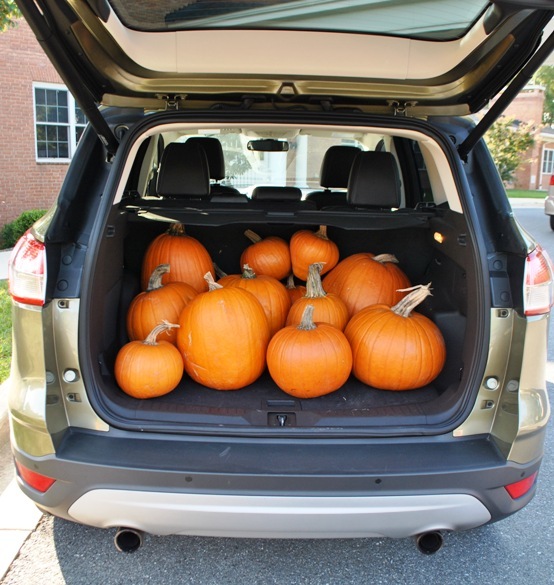 The 2013 Escape’s rear cargo area had no problem accommodating our family’s set of luggage, a jogging stroller + groceries, or a preschool class field trip’s worth of pumpkins! Although after years of city living I pride myself on my parallel parking skills, I enjoyed using Active Park Assist when parking at a metered space in Downtown Silver Spring. Ultrasonic sensors measure the distance to the curb and between parked cars. Once a spot that’s big enough is identified, the car literally parks itself. The driver only handles the shifting, gas and brake, and the car handles the steering for a perfect parallel park on the first try. The Sony audio system’s HD speakers were very clear for both local and satellite radio, and I loved the ease of navigating channels from the steering column. The reps from Ford showed me how to easily sync my iPhone with the MyFord Touch system, and soon my contacts, playlists and addresses were easily accessible on the Escape’s big (eight-inch) LCD center touch screen. I used both voice commands and touch to call friends, find locations on the navigation and change radio channels. I also could charge my phone while driving using the USB port. I love a car with a keyless start. Simply zip the Escape’s key fob into a pocket or your purse, hop in without unlocking and then push a button to jet off — the car’s sensor detects that the key is on your person. I have experienced this convenience in a previous car review and it rocks. 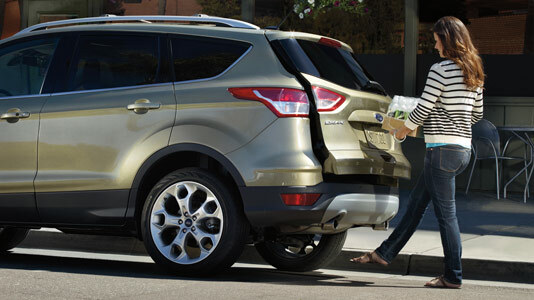 However, the Escape’s foot-activated liftgate was a brand new “wow” moment for me. When your key is on your person, you kick your foot under the bumper and then step back and the power liftgate automatically opens. I did it while my arms were full of my toddler to get her stroller (an action that is often awkward but I thought was just a part of life) and again when my arms were full of groceries. I felt like I gained a third arm. It was a dream. 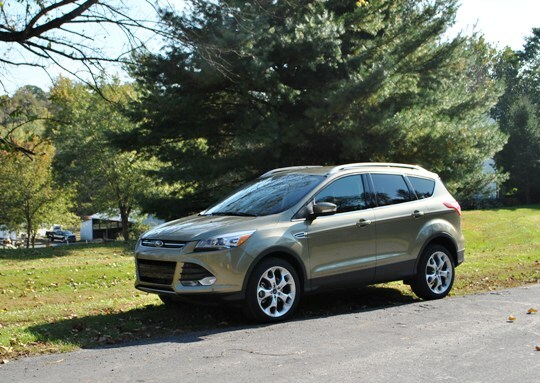 In short, the 2013 Ford Escape Titanium was the best family-minded SUV I have ever driven. It utilizes the most current technologies without dipping into luxury car price territory. I was impressed and hated giving it back. I received a 2013 Ford Escape Titanium to test-drive for three full days. No other compensation was received. It was a pleasure to review. Every time I see that foot-activated lift gate commercial, I am newly impressed. Best. Idea. Ever. This sounds awesome. 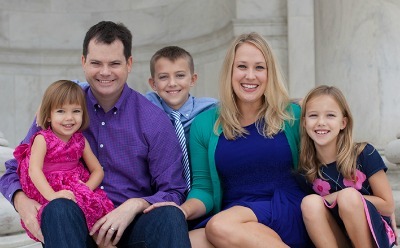 We’ll be in the market next fall for a new ride !